USAopoly (The OP) has partnered with FOX Consumer Products to release Dice Hard: The Nakatomi Heist Board Game this spring. 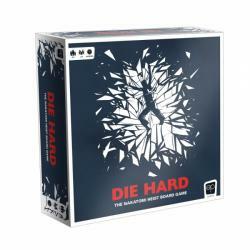 Based on the action movie classic, Die Heard: The Nakatomi Heist Board Game will be an asymmetric game with one player taking the role of John McClane, while others act as thieves, cooperating to foil the hero’s plan to save the hostages in the Nakatomi Plaza high-rise. The game will include callbacks to Die Hard’s most memorable scenes, events and characters. The game board will unfold into three different playing surfaces at different stages of the game, a unique feature that allows different play for the three acts of the story.